Using the thermodynamic algorithm of Sugawara (Contributions to Mineralogy and Petrology 141, 2001, p. 659–686), FeO and Fe2O3 concentrations in plagioclase were computed for 420 published experiments on tholeiitic, FeTi-tholeiite, calc-alkaline, and alkaline magma compositions. Estimates of the partition coefficient between plagioclase and liquid range from 0.19 to 0.92 for Fe2O3 and from 0.008 to 0.050 for FeO, i.e. ca. twenty times greater for Fe2O3 than for FeO. Partitioning of Fe2O3 and FeO is independent of both oxygen fugacity and plagioclase composition, contradicting the common assumption that partitioning of Fe2O3 correlates positively with the amount of aluminium in plagioclase. In contrast, the SiO2-content of the magma correlates positively with the partition coefficients for Fe2O3 and FeO. This is ascribed to increasing activity of iron in polymerised SiO2-rich magma. Advances of micro-beam Fe-XANES techniques allow the determination of Fe3+/ΣFe in plagioclase. Using such plagioclase data and the partition coefficients for Fe2O3 and FeO, the Fe2O3/FeO and oxygen fugacity of equilibrium magma may be estimated. As petrological examples, we estimate that the oxygen fugacity of the Palisades sill ranged from the QFM buffer to 0.5 log unit below it (QFM to QFM –0.5), the Lake County basalt from QFM to QFM –2, and Upper Zone a of the Skaergaard intrusion from QFM –1 to QFM –1.5. This work was carried out as part of K.L. Lundgaard’s PhD project financed by the Science Faculty at the University of Aarhus. Danish Natural Science Research Council grant 21–01–0297 supported this work. The manuscript was improved considerably as a result of constructive discussions and comments on early drafts by R.G. Cawthorn, J.S. Delaney, M.D. Dyar, C.E. Lesher, J. Longhi, P. Thy and J.R. Wilson. 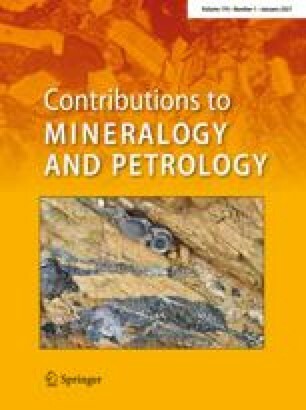 Thorough journal reviews by M. Henderson and M. Wilke, and the editorial handling by I. Parsons is also appreciated.